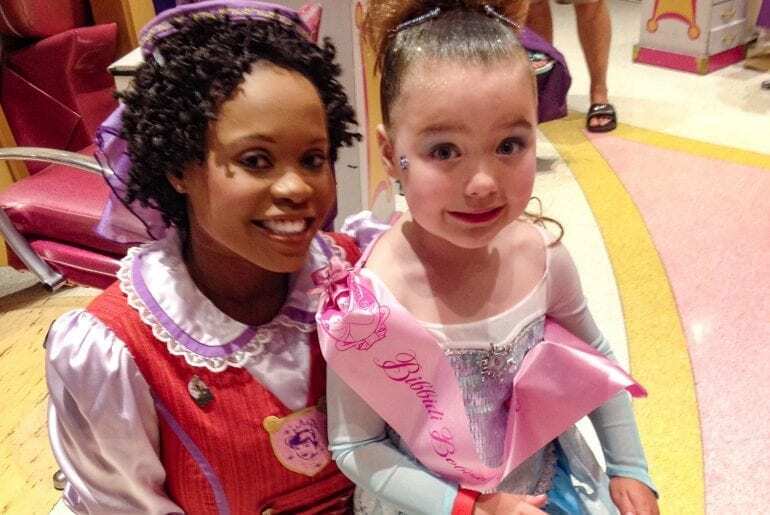 One of my favorite Walt Disney World memories is when Kristin became a princess at Bibbidi Bobbidi Boutique. I have been asked about this experience, so I thought I would share this memory with you. Kristin was four years old at the time, and she was a huge Frozen fan. I asked her if she would like to look like Elsa at Disney World, and she was so excited. For us, four years old was the perfect age to try out Bibbidi Bobbidi Boutique. We like to plan a trip for every other year, and as she’s gotten older, she has been just a little less into looking like the princesses. She was at the height of her love of Disney princesses for this trip. I admit that I am a planner when it comes to trips–especially Disney trips. I don’t want to miss anything simply because I didn’t know I should reserve a spot. This obsession has served us well during our adventures. At Bibbidi Bobbidi Boutique, you can reserve your spot 180 days out. 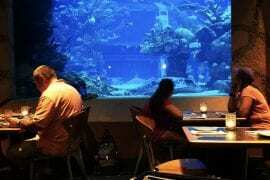 For this experience, I don’t believe that booking at the 180-day mark is mandatory like it is for other experiences, like Be Our Guest Restaurant or Cinderella’s Royal Table. Still, it’s a good idea to book as soon as you know what day you’d like to do this. Also, note that this experience is only available for children ages three to twelve. I called directly to make a reservation. You can find the number and current prices here. 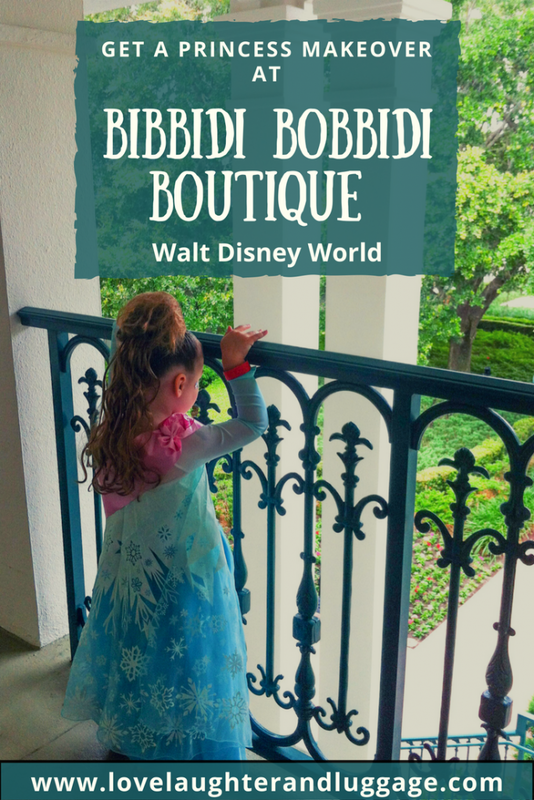 There are two Bibbidi Bobbidi Boutique locations at Disney World–one is at Cinderella Castle in the Magic Kingdom, and one is located at Disney Springs in the Marketplace area near Once Upon a Toy. The salon at Disney Springs has been moved and redesigned since our visit, but the experience is the same. When we go to Disney, we often arrive a couple of days before our Disney resort stay and our park days. Since we drive, it allows for some flexibility. We are able to be sure we are rested and ready to go for our first park day. This trip was no exception. We stayed offsite for our first night, and then we moved to Port Orleans Riverside for the first three days of our trip. I saw the opportunity to do this experience on a non-park day. I booked an appointment for opening at the Disney Springs location. I then made a reservation for the Cinderella dinner at 1900 Park Fare at the Grand Floridian for dinner. We could have some great Disney experiences without using park time. I decided to go with the Crown Package. This included a hairstyle, make-up, nail polish, a sash, and a cinch bag. We brought the dress with us, which is not a bad idea if your child is set on being a specific princess. At the time, the Elsa dress was at the height of its popularity, and I didn’t know if we’d be able to get one at Disney. Even our closest Disney store was doing drawings for them. I bought one on eBay months in advance of our trip. 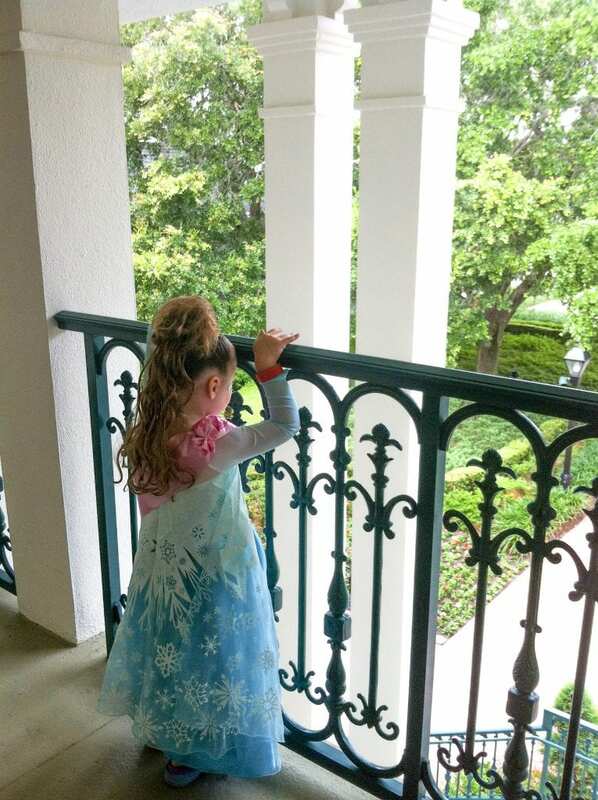 By the time our trip rolled around, there were no Elsa dresses anywhere on Disney property. I don’t know if a princess dress will ever be that popular again, but it’s entirely possible that the Bibbidi Bobbidi Boutique location you are in could run out of a specific style or size. Some kids also complain about the comfort of the princess dresses. There are some more comfortable alternatives out there, so that’s another thing to keep in mind. We checked in as soon as we could for our appointment. We were one of the first appointments of the day, so we arrived a little before they opened. We were directed to a changing room so Kristin could put on her dress. 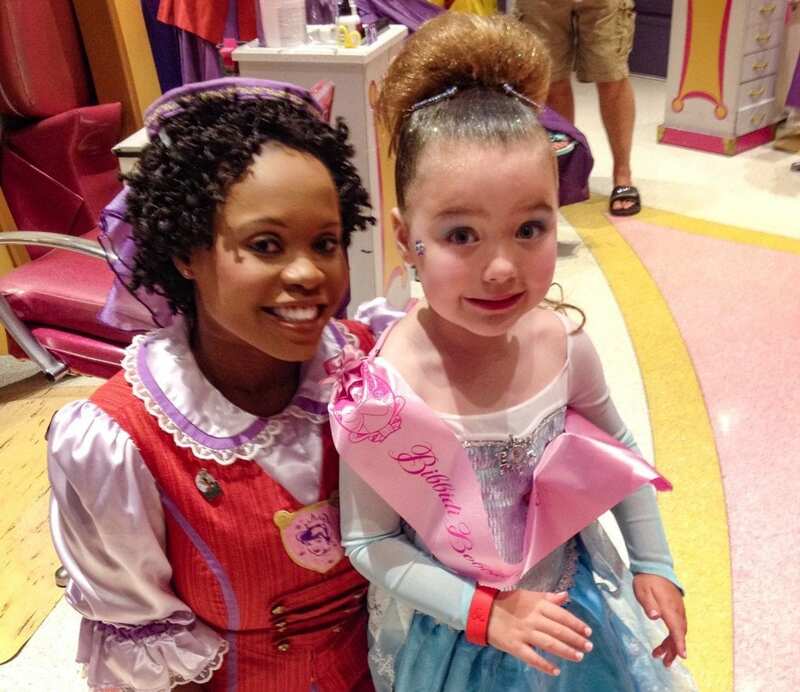 After she changed, she met her Fairy Godmother-in-Training who would be doing her makeover. Kristin was shown her seat, and the Fairy Godmother-in-Training got right to work. She turned Kristin away from the mirror so she couldn’t see her transformation until the end. Bibbidi Bobbidi Boutique suggests that you should bring your own comb or brush, which we did, but the Fairy Godmother-in-Training used a comb that she eventually gave to Kristin to keep. There are three hairstyles that you can choose. Every once in awhile they add something special, but usually, you have to choose one of the three. 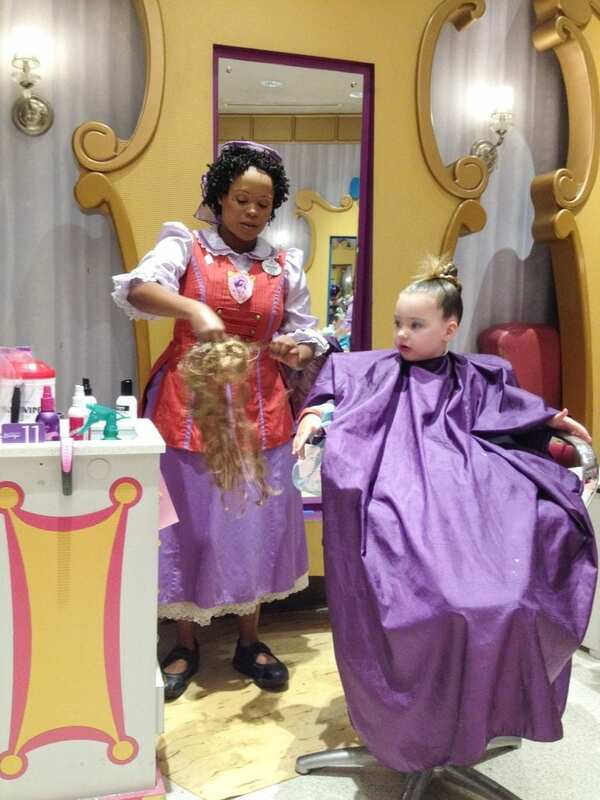 It’s not really a salon with licensed cosmetologists, so the Fairy Godmothers-in-Training are only allowed to follow the selections as offered. Kristin chose the Diva Style with the hair extensions. The Fairy Godmother-in-Training then put Kristin’s hair into a ponytail that she divided into two. Then she braided each section into a separate braid. She used plenty of gel to keep her hair smooth and in place. The Fairy Godmother-in-Training was really fast. I suppose she’s had a lot of practice. She then pinned the braids into a bun on the top of Kristin’s head. After she did the bun, she let Kristin choose her makeup palate and her gem sticker for her face. Kristin was then able to choose her nail polish color. She had a choice between pink and blue during the makeover, but she got to keep both bottles of polish; on this day she chose pink. Next, it was time for Kristin to choose the hair extensions. She chose hair that was similar in color to her own, but she could have chosen blond or even pink hair if she had wanted. The Fairy Godmother-in-Training attached her hairpiece and arranged it. The hair had a lot of curls, and some of the strands were pink with Mickey heads attached. The package comes with two bobby pins with jeweled Mickey heads for the top of the hair near the bun. It also comes with a Mickey-jeweled hairclip that is fastened underneath the bun. All of these touches were really cute! After the hair was attached, it was time to spray that hair. This hair-do was not going anywhere anytime soon, I’ll tell you that. Also, you can’t be a princess without copious amounts of glitter. Kristin’s back was to the mirror throughout the entire process, so she didn’t know how she had transformed. It was time for the magic words and the turning of the chair. Bibbidi Bobbidi Boo! She was pretty amazed by her makeover, and I will always remember this moment and her smile. Kristin had become a princess! The appointment was over, and we thanked our Fairy Godmother-in-Training. It was such a magical experience. You can have your pictures taken by PhotoPass photographers while you are there. You can also now do a photo shoot at Disney Springs after the makeover. At the time, you could do a photo shoot at the Magic Kingdom afterward, but, as mentioned above, we didn’t go to the parks on this day. Instead, we shopped in Disney Springs for awhile, and then we went back to our room at Port Orleans Riverside. We did take some pictures there. We had an excellent experience, and I’m so glad we did it when we did. The timing was perfect for Kristin. If you have a boy in your party and you would like him to join in the fun, there is a prince package available, too. Also, if you can’t get an appointment at one of the Bibbidi Bobbidi Boutique locations, you do have some other choices. 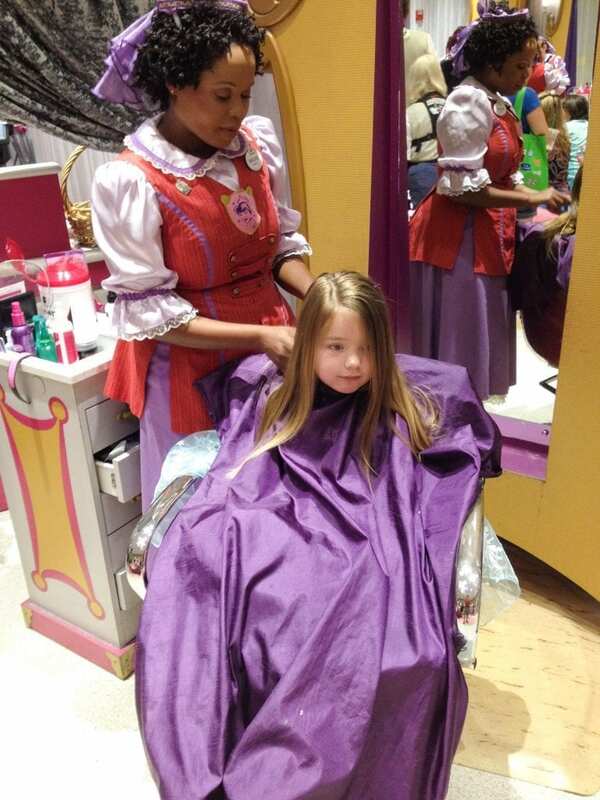 In the Magic Kingdom, you can visit the Harmony Barber Shop on Main Street. This shop does have licensed cosmetologists, and you can get a haircut with glitter. You can even get your baby’s first haircut there, and the baby will get a keepsake certificate. There are no age restrictions at the Harmony Barber Shop. Another option at the Magic Kingdom is the Pirates League in Adventureland near The Pirates of the Carribean. At the Pirates League, your child will be transformed into a pirate or a mermaid. This experience is only open to kids older than three. 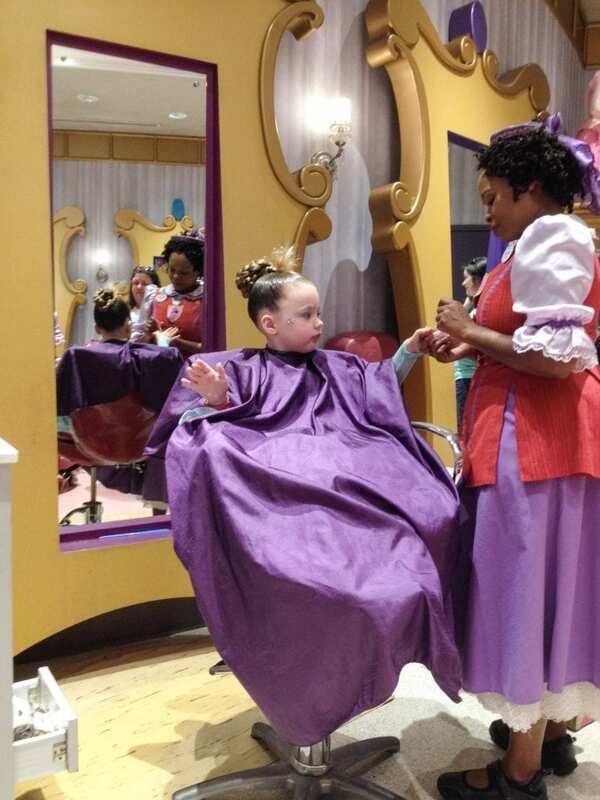 Another option for a princess makeover is at the Grand Floridian Resort and Spa. 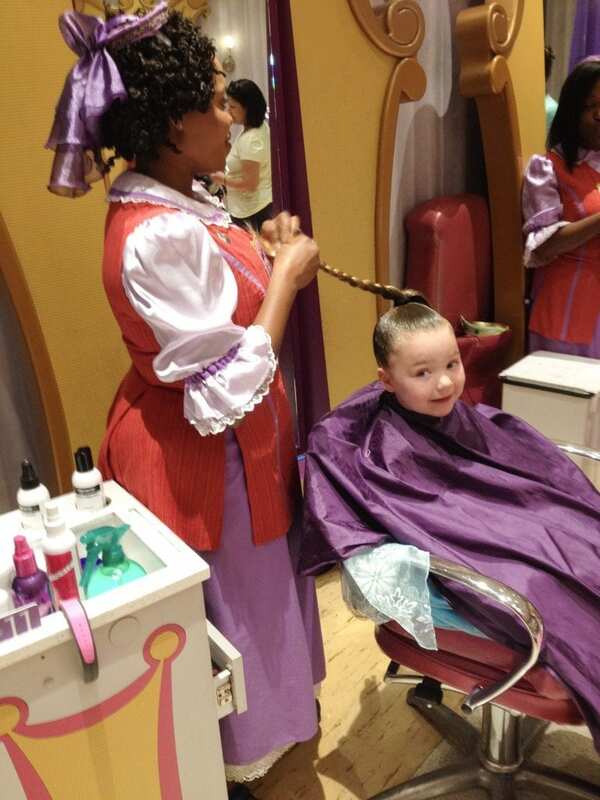 The Ivy Trellis Salon offers a Perfectly Prepared Princess Package for children ages three to twelve. 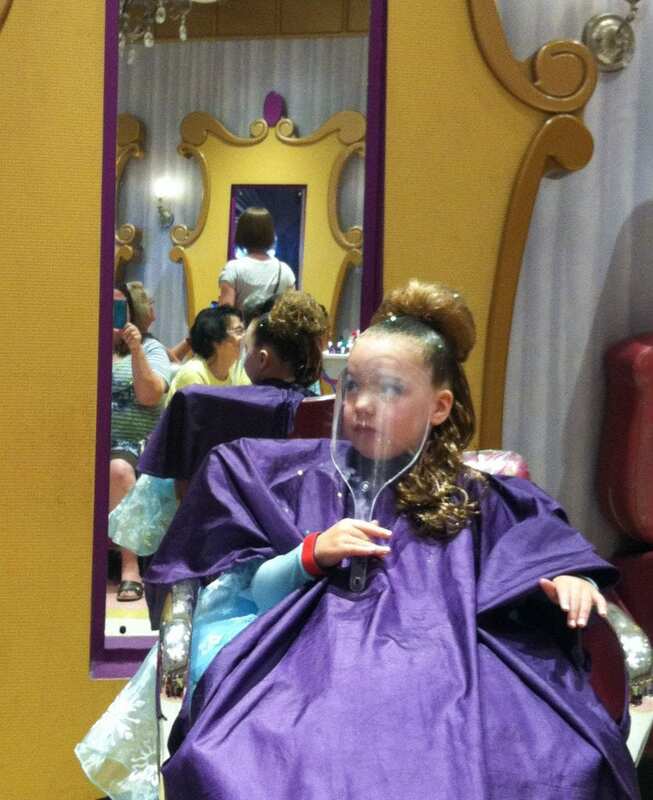 Realize, though, that this is an actual salon at the resort, unlike Bibbidi Bobbidi Boutique. I hope all children who would like to experience this at Disney World are able to have the opportunity. Kristin’s princess makeover remains one of my favorite Disney memories. For us, the memories we made at Bibbidi Bobbidi Boutique were worth the money, and I would do it again in a heartbeat! This is such a great, comprehensive review and I completely agree! Our daughter was five, and I highly recommend! It really was a great experience! I’m so glad we did it when we did! How priceless is her reaction?! I love it. I love seeing the girls after their BBB make-overs. You can just see that extra “swish” in their step. I wish my daughter had interest, but alas, no… although I did convince her to at least get pixie dusted. I love it when the girls have makeovers, too. My daughter doesn’t like thrill rides, so there are a lot of things she doesn’t do at Disney. I actually can’t believe she rides Splash Mountain but not Goofy’s coaster! I had no idea they did that! What a great idea! Wonderful memories for sure! Yes, I will always remember it! It never occurred to me that the boutique might run out of a dress, so thank you for the tip about bringing your own! It’s genius and probably a lot cheaper, too. I agree it’s best to time it well, my 2 year old was too little for the bibbidi bobbidi boutique on the Disney cruise, but I don’t think she really would enjoy it until she’s older. 4-6 seems ideal! Thank you for such a comprehensive review! We’ve done well to find dresses on clearance at the Disney store. We’ve purchased a Belle and a Cinderella one that way. If you can do that, you’d save even more! That enchanting Disney World magic comes through again! Thanks for the post! Yes, it does! I love Disney! This is so cute! I’m glad they offer this experience for children…. I wonder if it’s more fun for them or the parents? It was definitely fun for me, but I think Kristin like it, too! What an amazing experience! So fun to see her reaction and excitement. I wish my daughters could have experienced this. It really was a great experience! Loved BBB when my daughter was little, she did it at Disneyland for her 10th birthday, she still has all of the “stuff”. 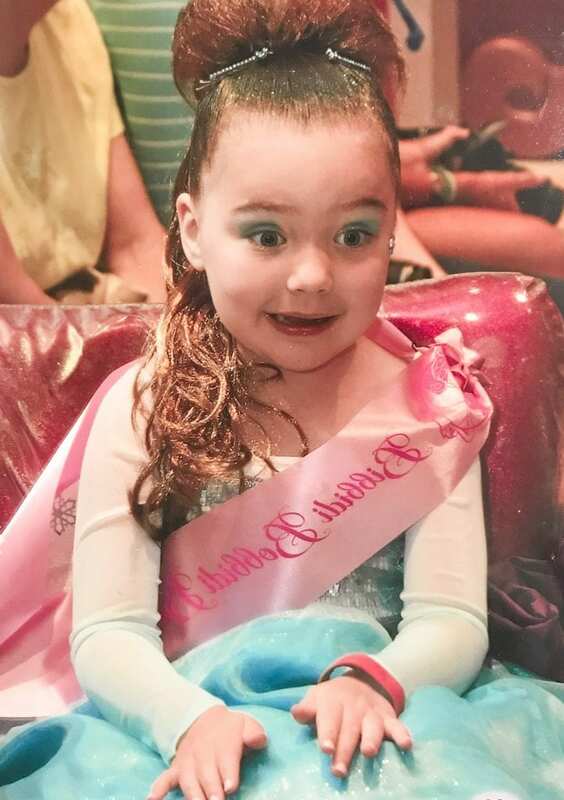 When we were on our Disney cruise last summer, she and her (16/17 year old mind you) friends all went into the BBB before dinner each day to get pixie dusted, which they did gladly for them. It was so cute to see them excited about glitter. Nothing wrong with a little pixie dust! We reused the stuff a lot. We even did our own version of BBB on the next trip for Cinderella’s Royal Table. Like you, I spend a ton of time with research before we take a trip. I would hate to learn about something after the trip that we totally would have loved. We might not see everything on my list, but it does help to give direction to our days. I agree! If I didn’t research, I wouldn’t have known that you need reservations to Thomas Jefferson’s Monticello in the summer. I can’t help doing the research! I love the look on her face when her makeover is revealed – priceless! Sounds like a fun experience. It is a great experience. It’s one of my favorite Disney memories. I remember wanting to have this done when I was younger. 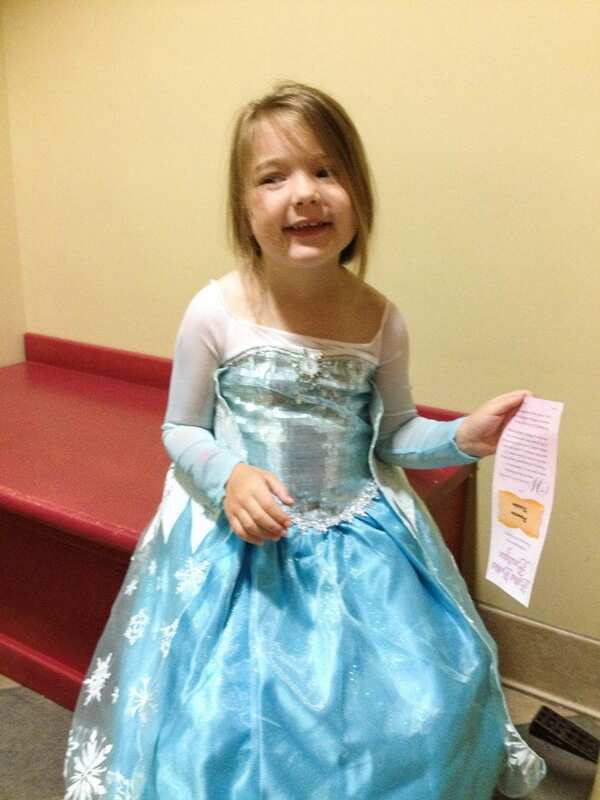 How lucky that she was able to go and get dressed up like a princess. Her face when she looks in the mirror is priceless. I’ll have to look into some of your other posts about Disney! I am a disney fan myself. I do love Disney! I’ll never forget that face in the mirror. To me, that’s what Disney’s all about. This sounds like a super fun experience! My girls would love it. Especially the glitter and makeup! It is a fun experience! I’m so glad we did it! This looks like so much fun! If we ever go to Disney (our daughter is one), I will surely have to remember this! You should take her! It was a wonderful experience! That looks fun. Here they have a group that puts on a princess day once a year where they dress the girls up and do their hair and makeup. That sounds fun! We frequently go to places in town that have princess days or nights, like Chick-fil-A or Orange Leaf. Those are a lot of fun, too! What a fun experience for a little girl! Wish I had done something like that as a child. Me too! I would have loved it! Oh, my goodness how precious are they?! This would be a dream for any little girl! Thank you for this fantastic review! It really is a wonderful experience for the little girls. Great memories! Wow, I just love the expression on her face when she saw herself and when she had her picture with the fairy god mother in training. That looks is totally worth just about any price. What a fun experience for a little one to have! It really was a great experience for us. I’ll always remember that expression! This is so adorable! I have heard a lot of young girls love this place at Disney! Thank you. Yes, it is a popular place for little girls for sure! My girls would absolutely LOVE this!! I am going to need to do this one day soon! It was definitely worth it for us! What a memorable experience, her expression was priceless! I’ll definitely recommend it to friends who have kids! Thank you! I’ll never forget her expression! I’d love to do a Disney cruise someday! How cute! It’s good to know that they put makeup on them so that if I do do this I can tell them to skip that step. Thanks for the tip on planning non-park activities! I wouldn’t have thought of that. You could skip that if you wanted. I was excited that she got to take the extra home. We used the makeup again at Halloween and on the next Disney trip. We also had extra polish a gem stickers. We’ve even used the hair multiple times! Look at Kristin’s reaction after she said the magic words! No wonder it will stay in your memory forever. This is a good review that I think every mother with little girl should read. Thank you! It’s an experience I’ll never forget! My daughter would absolutely love this! 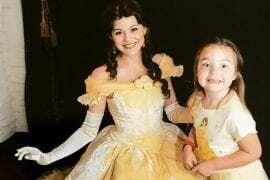 It looks like so much fun for a little girl who loves Disney! How fun! My niece did this and she loved it. It’s so cute the way they make it so magical. Your daughter will remember this for a long time! They do make it so special. I’m so glad they offer this experience! My girls would love this! Sadly, we’ve never been to Disney. This was a well written review. Thank you! You’ll have to plan a trip soon! It was a great experience, and it may be hard to top. But we do seem to find new experiences that are memorable, Disney and others! Adorable! 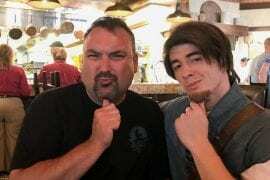 My son did the boy version of this years ago. They put so much hair spray and glitter in his hair. He LOVED it! They do use a lot of glitter and hairspray! Aww the look on her face, what an amazing thing to experience, getting pampered and dressed like that. It might not be an experience you won’t forget but I’m sure it will be the same for her too. Smiled as I read through this, I have a little cousin and her reaction would have been just the same. Super cute pictures, and super cute traditions. I am not into princesses, so by extension my daughter isn’t either, but I think this is a cute idea for any little girl who is. How long did the hairstyle last? I’m thinking to take my daughter to the Disney Springs location the evening before we go to Epcot. She would love to look like a princess she meets Elsa. I don’t have a park hopper so going to MK and then Epcot isn’t an option. And going to Disney Springs early morning for BBB before Epcot will be a lot of running around.